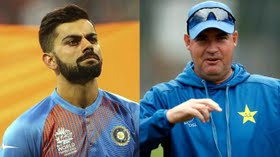 Pakistan coach Mickey Arthur has hailed India’s captain Virat Kohli as one of great match-winners of the present era. At the same time, he also went on to challenge the Indian captain, stating he will find it difficult to score in Pakistan. “Kohli is a fantastic player but our team will make it hard to score a century there. It has been a great pleasure to watch Kohli scoring against all teams and it is always enjoyable to watch his batting. However, our bowlers will not make it easy for him to score there,” Arthur was quoted as saying in an Indian Express report. India have not played against since a short limited-over series in 2012-13. In fact, post Sri Lanka in 2009, no team has visited Pakistan. “Hopefully, India will come to play in Pakistan,” Arthur concluded.